Beach style multi-level home situated right on the bluff offering unobstructed views of the Pacific. Upgraded kitchen with stainless steel appliances. Deck with a hot tub. Large seating area in the main living room with One gas fireplace and wireless internet. Four bedroom 2 bath home that can accommodate eight guests. Three bedrooms are located on the ground floor with the last bedroom situated atop a spiral staircase with a view over the dining room. Great home for large families or even two small families. Rates shown for this home are for up to 4 people any additional guest will incur additional fees. 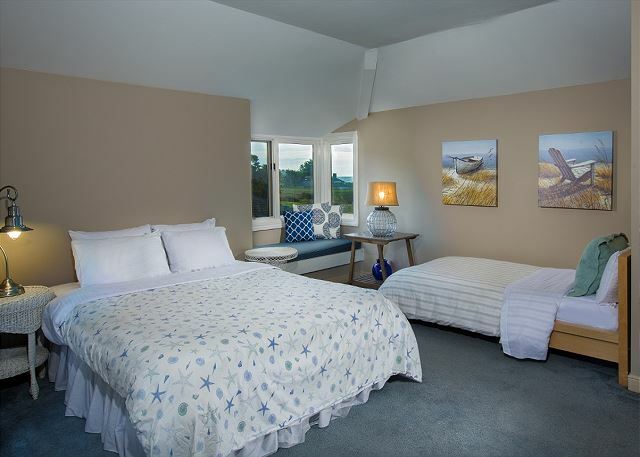 This is a beautiful home situated on the bluffs overlooking the pacific. No matter what the weather is doing, you will enjoy your stay. I have no issue with the house. It was clean, well appointed and we had a great time. My only disappointment was the timing. We weren't allowed to check in until 4pm Friday and check out was at 11am Sunday. So really we only had 1 full day and two nights. It would be nice to be able to check in around 2pm and check out at noon...just sayin'. 2 hours should be more than enough time to clean and prep for the next guests. I now this isn't an issue with the owners. I assume that its a standard set bu the Sea Ranch association whom manages this house but It should be considered when you are thinking about renting from the association. Otherwise we had a great time! 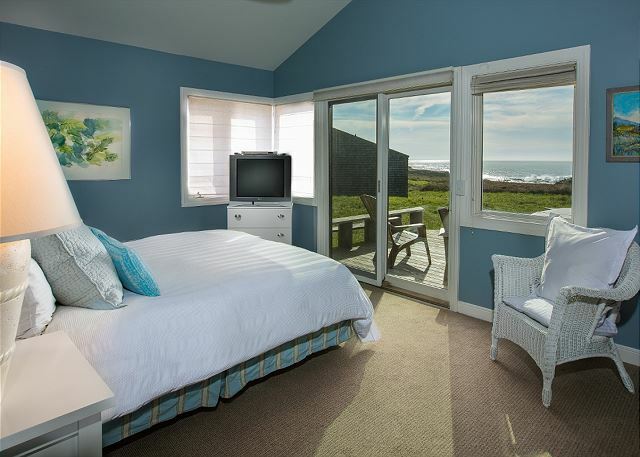 For 23 years family and friends have rented homes in Sea Ranch and have had a wonderful experience. 5 girlfriends had their annual reunion. There are 4 things that are extremely important to us to enjoy our week. Music, TV, movies, and a hot tub. I even mentioned this to the woman I rented the home from in the beginning. First and foremost, the Gregg home is in a fabulous location, has a new fabulous hot tub.......we had no TV, no way to watch movies, and had to wash the majority of dishes before we used them. The flies the first day were a real bother. Once we killed them all middle of second day we were fine. We were told that it is fly season and everyone had the same problem. The rest of the problem. We called the lodge and voiced how disappointed we were and left a message to be given to the operations manager, Salvador Garcia, to please call us to see if something could be done. After two days I called back and talked to a very nice woman, Rhonda, at front desk. She then switched me over to a voice mail number for Sal where I left a message (again) for him. Nothing. As we checked out he happened to walk by and got an ear full from me and one of my friends. We felt he was rather condescending and bothered by us even telling him our woes. Isn't that his job? Having been a business owner one thing that is so important is COMMUNICATION!!!! All he had to do was call us and we could have worked something out. He did inform us that the owners had stopped the TV service a week prior and that it was their fault. I also suggested we get some kind of a refund for the money we all had to pool together for this week. He said he understood, but it would have to come from the owners of the Gregg because it was their fault. Sadly, this was the first time renting from the lodge and most likely the last. In past years if we ever had a problem through another management company they had someone on our doorstep in 30 minutes. The Gregg Home has an amazing ocean view. Although built in the 70's, it has a lovely updated kitchen and was found clean and well stocked with towels and toiletries. We saw quite a few deer grazing around sunset. The Sea Ranch Lodge staff, however, was not friendly or accommodating. Cons: The kitchen cookware is very used and needs to be replaced as it's quite gross and dilutes the joy of cooking. There is exposed wiring, near the ceiling in the hallway by the two downstairs bedrooms that makes one uncomfortable. The floors upon arrival were noticeably dirty. Enjoyed the out of doors great views and walking ... the house was a bit dusty and lots of sand in hot tub. We stayed for four nights. The weather was perfect! The house is very comfortable and has everything you need. The views are fabulous! Wonderful house - very very difficult to contact property managers but once I could get communication passed along - all staff were very nice and helpful. There is a problem with the gas fireplace. The location, the views, the amenities, the cooking facilities are top notch. Sea ranch has been dear to our hearts for the 40 years we've been coming. This house offers by far the most superb views with window seats for all. Watching the whales go by and the sunset every night was a joy. It was very clean and essentially bug free which was really a pleasure. The fireplace was gas with a real fire- all the ambience without the mess. The kitchen had modern stainless steel appliances and a gas stove. Pots and pans were Ok. The spacious loft up the spiral staircase was darling and had a door that shut and a window-like opening with shutters that closed making it more like a 4th bedroom. Bathrooms were small but adequate. Hot tub was fabulous. We'll be back! The Gregg Home absolutely lovely. 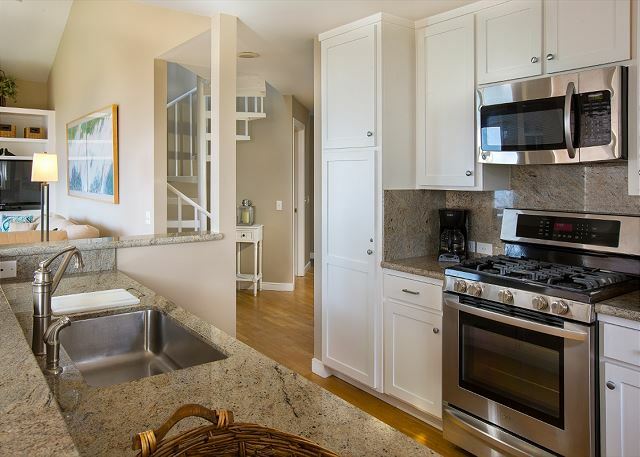 It is exceptionally clean, the layout is open and inviting, and the view of the ocean is stunning. There are many trails for hiking and biking, and I was happy to greet the deer that came right up to the windows in the early morning. It is also nice to hear the waves pounding when I first woke up. The gas fireplace is great and the kitchen is well stocked with cooking apparatus of all kinds. The Sea Ranch Lodge is close by, about 5 minutes away, with a lovely restaurant and bar. I would most definitely recommend this rental to a friend or relative, and, in fact, I have already done so. We love this house. Unfortunately the heater was broken. Sea Ranch provide a small space heater so we survived. We understand the heater would be fixed and we will definitely return to this house again and again. Absolutely loved this house. Perfect location just a 5 min walk to a staircase to get down to a beach. Right on the ocean bluffs. House is modern inside and has all the utensils necessary to cook meals. Loved our stay here. My family's stay at the Gregg Home was a wonderful experience. The evenings were magical! Home was very nice... comfortable and spectacular unobstructed ocean views. A few very minor tips for property manager: Fitted sheets would be more comfortable as the flats pull off the bed while sleeping; TV room needs more than 1 cozy throw blanket; Kleenex was not provided although on the supply list; Guest Book was full so we couldn't sign; Hot Tub was pleasantly heated to 105 when we arrived, but no instructions about it, so we were a bit nervous about it being on when we arrived and when we departed. We rented the Gregg Home as our home base while getting married in The Sea Ranch. It was everything we hoped for and more. The location on the bluff is stunning. The perfect setting to begin a life together and hopefully return to for many anniversaries. We had a wonderful two nights at the Gregg Home. The view was perfect and the house was very comfortable. We would definitely return. On behalf of the team thank you for taking the time to post a review on your recent stay at the Gregg home. We appreciate the great feedback and look forward to hosting you again. Not only was checking in incredibly easy and hassle free, but from the moment we stepped foot on the front porch of the Gregg Home we knew we were in for a treat. The home itself is incredibly comfortable and the window seating in the livin room is fantastic, makes you never want to leave. The views in this home are incredible. The hot tub outside of the master bedroom was fantastic. My family and I have will continue to rent this home in particular. We didn't want to go home. On behalf of the staff, thank you for the absolutely wonderful review of the Gregg home. I could not agree more, this home is a very special property and the views the homes offers are breathtaking. We look forward to welcoming you back when your travels bring you back into the area. Lastly, I will be sure to thank the Front Desk crew at Sea Ranch Lodge for doing a great job at check in. a. there are giant ditches on the South/West site are unsightly, and a hazard, please fill them. On behalf of the team thank you for taking the time to post a review on your recent stay at the Gregg home. Please know that I will work with my team to resolve the issues you encountered and speak with the owners regarding a new mattress. We look forward to welcoming you back next year. 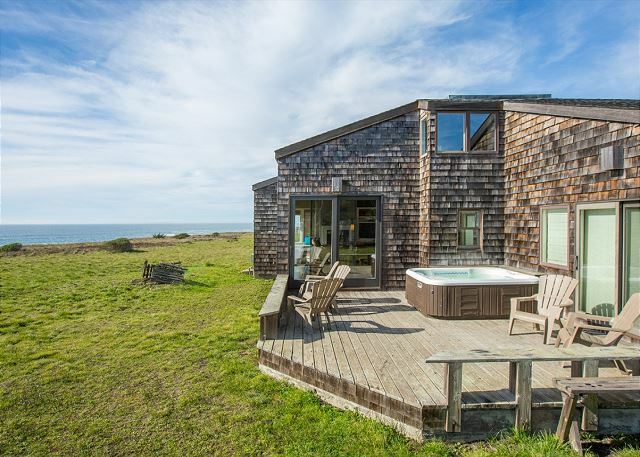 This home is a great place from which to enjoy Sea Ranch and the coast. Check-in was very easy, and the house is in a convenient location within the development. The home itself is in great condition. The layout was perfect for our family of 6 adults (3 couples). 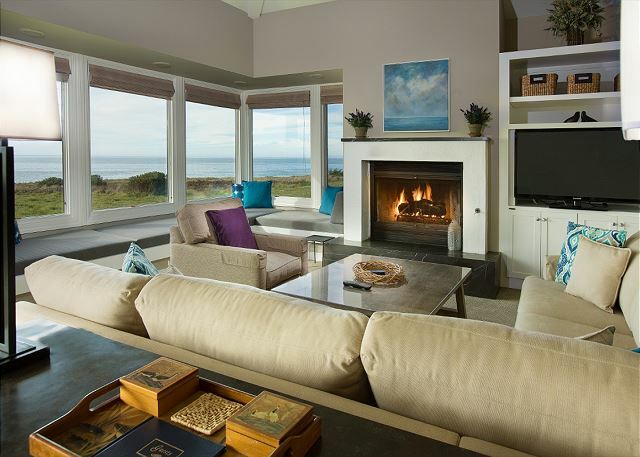 We loved the view, and loved the open main floor plan with lots of light during the day and a fireplace at night. We truly enjoyed this lovely home. It was raining heavily the whole time, so the experience of living indoor in this house was crucial. Amazing location, spectacular view of the ocean. We did not feel the presence of neighbors. Functional at all levels, well equipped, and good layout to preserve each bedroom privacy while engaging common spaces. Only challenge when you have 9 persons sharing the space is the PARKING SITUATION: only 2 cars are allowed on the property! So the solution was to park the additional care at the main entrance parking lot: a 7 minute drive away. On another note: staff was misinformed on 2 important topics: the actual TOTAL COST of the stay, the breakdown was unclear and each front desk person I talked to had a different version! Also, the layout description: staff couldn't confirm the actual number of bedrooms and beds available: we ended up underestimating it, missing out on having a couple more friends joining us. And a couple minor details: gas fireplace instructions were not available, and staff was unaware on how to operate it. Had to figure that one on our own (also were misinformed: the fireplace was supposed to be a real wood fireplace...), we ran short on bath towels. But on the big picture, we had a memorable time! My family and I enjoyed our time at the "Gregg Home". The home was nicely updated with useful amenities. The home provides a cozy experience with wonderful relaxing views of the ocean. This house is in a fantastic location so for that reason alone we would stay again. The house is in ok shape. We had to replace the front light which was burned out. Housekeeping did not leave any coffee but we got some from the hotel front desk. We arrived on a Sunday and the receptionist was not really sure where the house was - although together we figured it out. The windows have broken handles and some of them don't open. Hot water takes awhile in the shower and water pressure is not great. Hot tub is not overly clean and not too hot. But it was a vacation house (not our own home) and we enjoyed our stay. The TV and Wifi worked great as did all the appliances. Dear Mr. Csrnko, Thank you for taking the time to complete a review on the Gregg home. I apologize for the issues you encountered at the home, but appreciate the comments. Please know that I will be sure to have my team get into the home to take care of the windows and have the spa company come clean the hot tub. The hot tub is serviced weekly, so I will make sure I follow up with the company we use. I hope your travels will bring you back into the area again soon. 25 yards from the ocean side of the property. Dear Mr. Kosloff, Thank you for taking the time to post a review on your recent stay. The team and I truly appreciate your wonderful feedback and look forward to welcoming you back when your travels bring you into the area again. What a beautiful community! The Gregg house was beautiful inside and out! 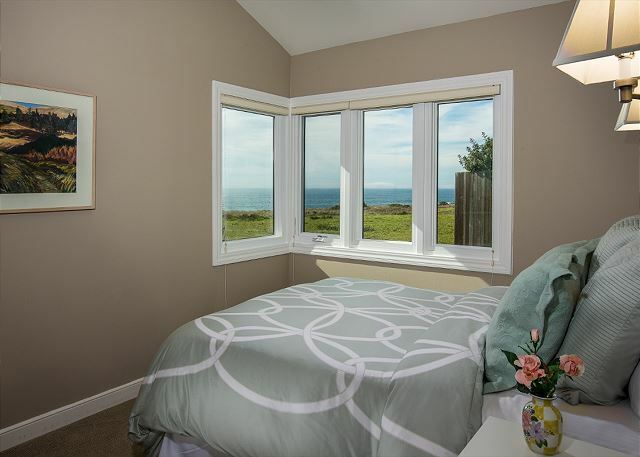 The views are amazing, right on the bluffs overlooking the ocean with trails right in the backyard. Plenty of room in this clean home with well stocked kitchen. Didn't get to use the hot tub but I bet it would be wonderful. The master bedroom got a bit cold relative to the reminder of the house because if the distance from the furnace so instructions on how to use the space heater would be useful. We tried using it but then it started making some funny noises so we turned it off. Regarding service, the front desk staff at the Sea Ranch lodge were not the friendliest bunch overall. Restaurant staff was very very nice and the chowder is amazing. Would definitely come back for a longer stay. We rented the property for the weekend of daughter's wedding. We loved the house and would rent it again. It is only 4 miles from the Resort. mathew c does not recommend this vacation rental. The location is great but the beds are cheap, the carpet in the living room is DIRTY, there were children's handprints on the Windows, several cupboard doors were falling off - not a high end or romantic experience at all. Dear Gregg family: this is a multi-million dollar oceanfront home - furnish and maintain it accordingly. Everything was ok no bad experience except minor ones such as Cable TV could not be made to work, and the seaview windows were dirty. Beautiful home with views to match! This home was beautiful, clean, & had great views. The only complaint, if you can call it a complaint(s) was the vacuum cleaner was broken & there wasn't enough dish soap. The pictures were right on. THe house and our experience were all 5 stars! My only comment would be that I'd like to see a recycle bin available in the kitchen. We tried to create one, but I'm hoping that SeaRanch does recycle. Everything about the house, including the staff of the lodge were wonderful. Thank you for the opportunity to communicate. Spectacular stay at the Gregg House! This house has all the amenities you could need for a great weekend! We cooked delicious meals, relaxed in the hot tub, slept in, read by the fire and in the window seats, went for walks around the Sea Ranch Property and completely recharged! Dear Kate, Thank you for taking the time to post a review on your recent stay. We truly appreciate the great 5 star review and I was glad to see you were able to take advantage of all the amenities in the home. This house is truly a gem with luxury upgrades and spectacular blue water views. When your travels bring you back into the area we look forward to hosting you again.